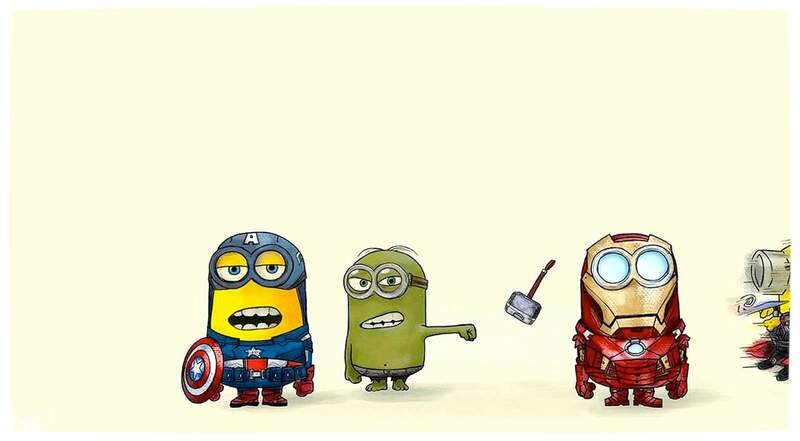 I haven’t seen Despicable Me, but I understand the appeal of the Minions. They’re the now-ubiquitous yellow blobs with coveralls and Homer Simpson hair, starring in your favourite crossover parody posters on the internet (like this one). Within the film they’re the servants of the villainous Gru, capable of making only grunts and vague attempts at coherent speech that some viewers find endearing. Because of how funny they were as a background aspect of a larger story, DreamWorks (EDIT: It was actually Illumination Pictures, because I apparently don’t follow proper research methods) jumped on that bend in the zeitgeist and gave them their own, self-titled Minions film. The resulting mediocre movie didn’t do as well critically as its mothership title, resulting in something passable and adequate rather than the comedy blockbuster DreamWorks Illumination Pictures was hoping for. 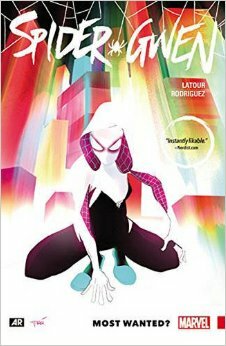 Spider-Gwen occupies a similar slot of “background element given its own platform”, and the ensuing comic series feels comparably bland. It’s by no means bad on the level of a Tony Daniel or Scott Lobdell book, but its lack of ambitious substance results in what I’d almost call an entirely forgettable sojourn, if it weren’t for the legion of cosplayers who’ve adopted Gwen’s new getup as their next favourite thing. 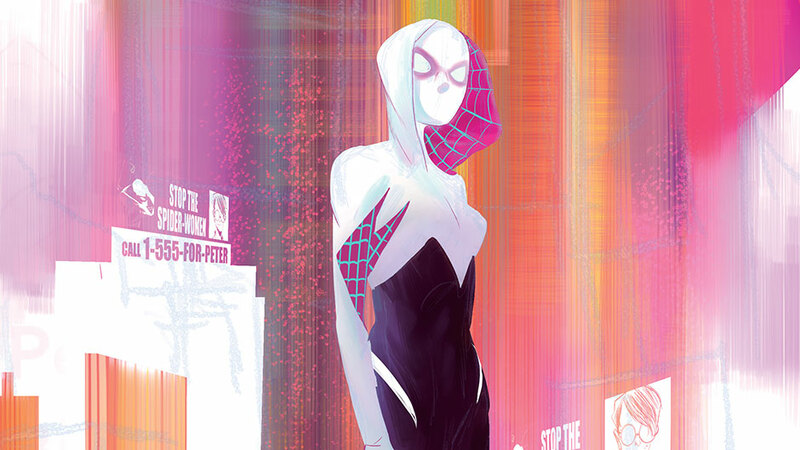 Our eponymous webslinger initially made her mark in the Edge of Spider-Verse miniseries, itself a tie-in to the Spider-Verse event that brought together the deep multiversal bench of Marvel’s arachnid-themed heroes. What begins in a cutesy little one-off issue of Edge – helpfully reprinted in this collection – spins out into a continuing series where, in an alternate Marvel universe, Gwen Stacy got the life-changing bug bite. The unaltered Peter Parker, jealous of Gwen’s powers, becomes that universe’s version of the Lizard and ends up dying, leaving Gwen racked with guilt in much the same manner our universe’s Peter is stricken by failing to save his own Gwen. 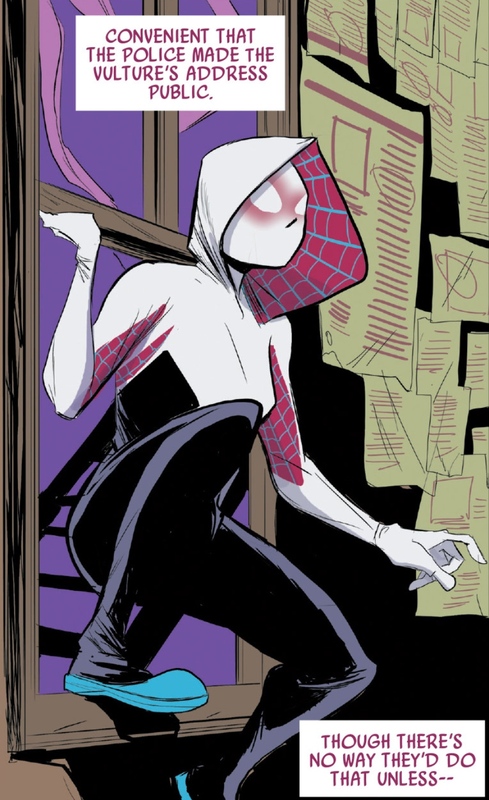 Thusly guilt-ridden, Ms Stacy continues on as Spider-Gwen, the hoodied saviour of New York pitted against a criminal, thoroughly amoral interpretation of Matt Murdock and his clan of Hand ninjas. Most Wanted? had the potential to meaningfully flesh out what could only be hinted at during the Edge of Spider-Verse tie-in. 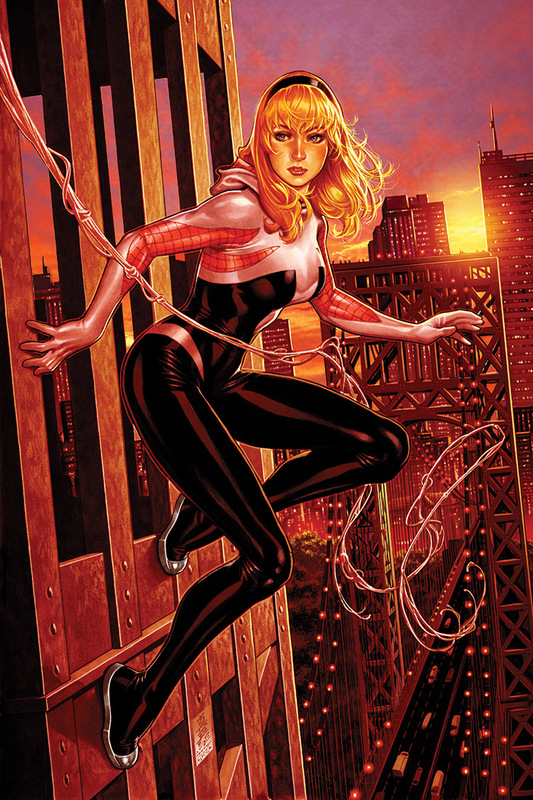 I was intrigued by the potential of an empowered, rapid-fire-snarking Gwen Stacy who can pole vault across New York with nothing but the web from her wrists. The fact the story resided in its own little corner of the Multiverse, unhindered by the 616 or anything Ultimate-related, was also encouraging: no event hijacking here! It seemed like a good combination of factors that should’ve produced a nice little story. While I won’t say Most Wanted? is a bad story, it’s certainly not one I liked. 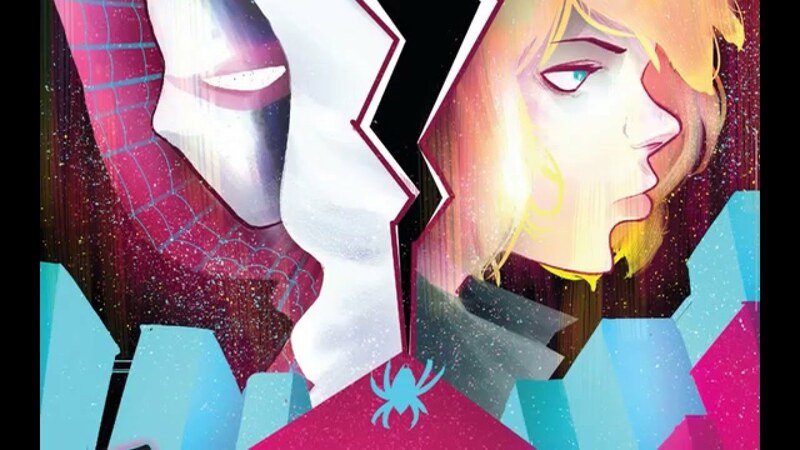 A large part of that may have been the truckloads of hype heaped upon the debut of Spider-Gwen’s ongoing series, augmented particularly by cosplayers and feminist readers. Maybe this is once again a reminder of the dangers of hype culture, especially when what worked in a nice little one-off or background moment is suddenly given too much space to expand into. Not every capebook requires Vince Gilligan-levels of depth, but one would at least expect an attempt at some substance. Most Wanted? falls at that hurdle until the book’s middle, during a wonderfully rendered series of scenes depicting Gwen hesitantly visiting her Peter Parker’s Aunt May and Uncle Ben. Everything until this point relies on flashy montages of battle inexpertly paired with attempts at brevitous witticisms, which run for far too long without offering much in the way of who Gwen is as a character rather than a superhero. Part of Spider-Man’s appeal is in exploring Peter as a young man, using the costume both as a day job and (at least initially) coping mechanism for his Uncle’s death. His wit works because we’re well aware of what he’s been through, what he deals with on a regular basis and what occurs when he takes the mask off and becomes Peter again. Gwen doesn’t manifest this kind of characterisation until that midpoint, where the full extent of her misplaced shame and guilt at failing to save Peter is beautifully and concisely explored during her conversations with Peter’s family. As much as the story irked me, the Elseworlds-style nature of its makeup also offered some things to like. Top of the list is a deliciously deplorable incarnation of Matt Murdock, who eschewed Daredeviling in order to be the slimiest protector of criminals completely legal attorney person, as well as the Millienially-insane Mary Jane Watson, here depicted as a rampant diva who fronts the eponymously-named band Gwen’s been ostracised from, and an anti-heroic – and decidedly Punishing – police officer named Frank Castle. The stronger elements are aided by the art stylings of Robbi Rodriguez (which, sadly, is not the nomenclature for a formerly famous Grindhouse director). There’s a distinct inspiration of graffiti art in Rodriguez’s work, slanting the illustration towards a grungy, almost French animation style of slight exaggeration and vibrant colouring. At times the art gets a little overloaded with red and purple colours, and Gwen’s body actions occasionally resemble more of a yoga-pilates Jedi Master than her character would realistically suggest, but overall it works fine with the story it’s telling. By far my biggest gripe is with the dialogue. Now, I understand both that I am not the target audience for this book, and that it isn’t unreasonable for contemporary teen characters like Gwen to speak in modern teenage lingo. But Mary, Mother of God is it annoying. Exceedingly little of the dialogue (again, with the exception of the scenes at Rancho de Parker) doesn’t immediately make me want to bury my palm into my frontal lobe. This is a book whose cast is led by teens, and by gum does the book want you to know it. A scene where Gwen’s phone’s been snagged drives that point home when Gwen protests, ‘My whole life is in that phone!’ Now, granted, that phone does contain information about her life as a webslinger, but the way the story’s dialogue frames this and several other scenes – including a Gwen-led quip-fest during a ninja onslaught at a rock concert, which includes the phrase ‘Pyjama party erry damn day, yo!’ – indicates it’s targeting a social media addicted, Tumblr-enveloped crowd of Millennials whose lingua franca cocktail consists of ear-burning sarcasm mixed with deplorable attempts at dry wit. Despite me not fitting Most Wanted?‘s intended demographic, I don’t think my reaction is purely a case of misaimed dialogue; the new Ms. Marvel series managed to make contemporary teen characters relatable and not come off as latte-fueled snark machines. 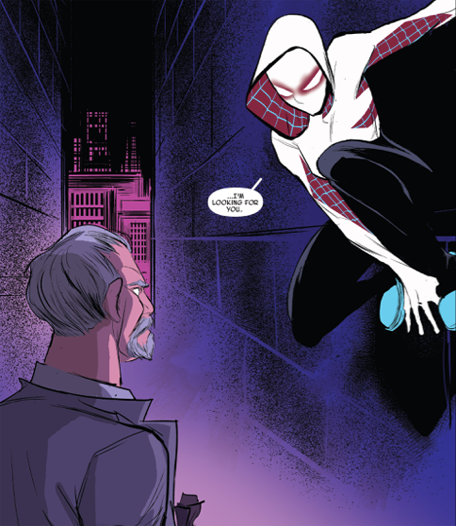 But like I said, I don’t think I quite align with Spider-Gwen’s target market. It’s entirely possible those of you the book is speaking to will find much to enjoy in Gwen’s attempts at sarcastic banter while swinging around New York, but I’m left once again thinking about that Minions comparison I started with. Divorcing a popular element from the mothership narrative means that element has to stand on its own, building a story strong enough for it to support alone. The one major thought that Most Wanted? kept prompting was that the character, on its current trajectory, can’t last for long and maintain her novelty; sooner or later she’ll change from her quirky starting incarnation, and become just another Marvel superhero comic. Where something like Ms. Marvel excels is in the plethora of stories G. Willow Wilson both implies and expands on in her exploration of Kamala Khan’s character, dissecting issues of ethnicity, culture and nascent adulthood alongside all the usual superhero trappings of villains and team-ups. 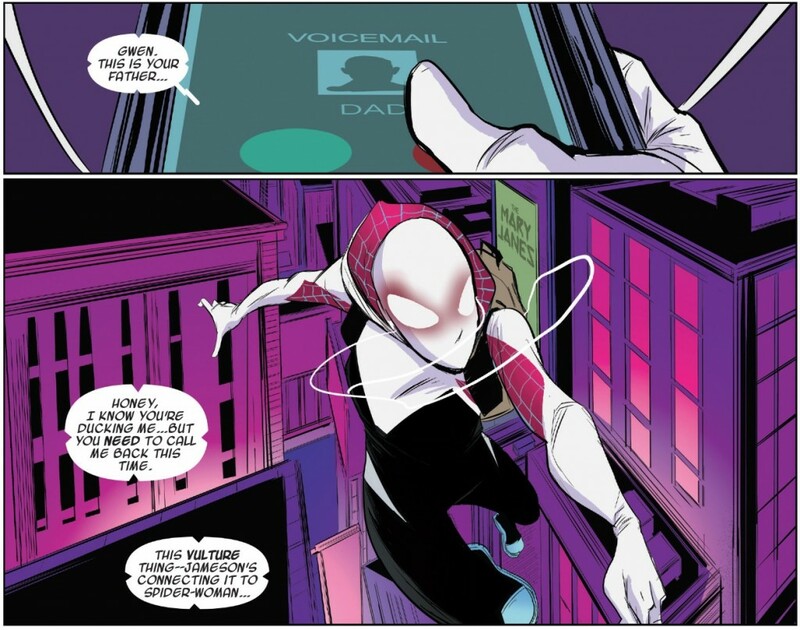 By comparison, Spider-Gwen appears to only have one clear narrative throughline – Gwen’s guilt over Peter’s death – and while it attempts to create another one with the relationship between Gwen and her father, that story doesn’t hold enough water to maintain my level of interest. Most Wanted? might be a fun diversion for some, but I wouldn’t bank on it as a continuing series. Seeing scenes of Minions within the larger Despicable Me narrative might be fun, but a full film of the yellow potato people feels like indulgence at the expense of novelty. Maybe Spider-Gwen could learn a lesson from that.